Bored of eating apples as a part of a fruit salad? 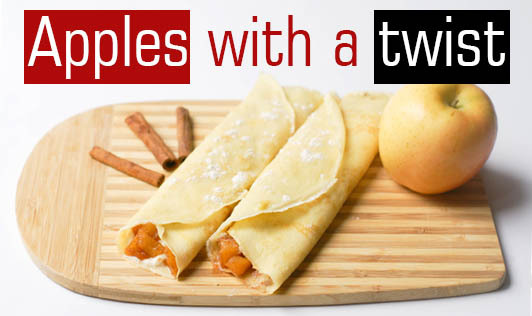 Here is an interesting way to have apples. The flavoured stuffing delicately elevates the simple taste of apple to its best! 1. Cut the apples into halves and core the centres. 2. Warm the saffron and rub with a little water until it leaves colour. Keep aside. 3. Mix together the sugar, lemon juice, 2 cups of water and the apples in a non-stick pan and cook on a low flame until they are soft. 4. Remove the apples from the syrup and keep aside. 5. Boil the syrup until thick. Remove from the flame and keep aside. 1. Blend together all the ingredients in a mixer till smooth and creamy. Keep aside. 1. Stuff each half of the apples with 2 tablespoons of the stuffing. 2. Arrange them on a plate and pour the syrup on top. Refrigerate to chill. 3. Serve chilled garnished with almonds.